- CHIKARA Eighth Show (October 26, '02) = Slyk Wagner Brown lost a "Three Way" Match to Don Montoya. Chris Devine was the other participant. - NWA-TNA PPV, Show #27 (January 15, '03) = In a dark match, Wagner Brown took down John Walters. - NWA-TNA PPV, Show #53 (July 16, '03) = In a dark match, Wagner Brown was beaten by Erik Watts. - RoH Wrath of the Racket (August 9, '03) = Slyk Wagner Brown lost a "Four Corner Survival" Match to Michael Shane. Scoot Andrews and Hotstuff Hernandez were the other participants. - RoH Bitter Friends, Stiffer Enemies (August 16, '03) = Brown lost a "Four Corner Survival" Match to Deranged. Jonny Storm and Hydro were the other participants. - RoH Beating The Odds (September 6, '03) = Brown defeated Diablo Santiago. - RoH The Tradition Continues (October 16, '03) = Brown & Sonjay Dutt lost a "Tag-Team Scramble" Match to Slugger & the Grim Reefer. The Ring Crew Express and Josh Daniels & Danny Doring were the other participants. - RoH War of the Wire (November 29, '03) = Brown & April Hunter fell to the Outcast Killaz. - RoH Final Battle Convention Card (December 27, '03) = Brown lost a "Four Corner Survival" Match to Hydro. Nick Gage and Oman Tortuga were the other participants. - RoH The Last Stand (January 29, '04) = Brown lost a "Six Man Mayhem" Match to Chris Sabin. Sonjay Dutt, Jack Evans, Caprice Coleman, and Hydro were the other participants. - 3PW 2nd Anniversary Show (February 21, '04) = Brown defeated Mike Kruel. - RoH At Our Best (March 13, '04) = Brown fell to Xavier. - 3PW The Future Is Now (April 17, '04) = Brown took down Ricky Vega. - 3PW Not Enough Time (May 15, '04) = Brown & April Hunter beat Matt Striker & Miss Talin. - 3PW Splintered (June 19, '04) = Brown & April Hunter won over Rob Eckos & Matt Striker. - 3PW No Limits (July 17, '04) = Brown lost to the 3PW Heavyweight Champion, Joey Matthews. - DPW Inaugural Show (August 13, '04) = Brown defeated Monsta Mack, then fell to Luis Ortiz, who became the first DPW Heavyweight Champion. - 3PW Five-Star Four-Way (August 21, '04) = Brown fell to Ruckus. Later on, Brown & April Hunter won the first-ever 3PW Tag-Team Titles, winning a "Tag-Team Battle Royal". - 3PW Till We Meet Again (October 16, '04) = Brown & April Hunter lost the 3PW Tag-Team Titles to the Pitbulls 2000. - 3PW For The Gold (November 20, '04) = Brown was beaten by Low Ki. - 3PW The Show Must Go On (January 15, '05) = Brown lost a "Four Way Dance" to the 3PW Heavyweight Champion, Christopher Daniels. Chris Sabin and AJ Styles were the other participants. 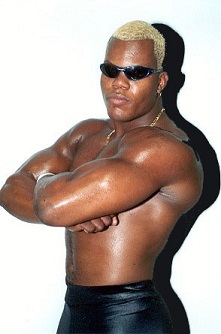 - 3PW 3rd Anniversary Show (February 19, '05) = Brown won the 3PW Heavyweight Title, taking down Christopher Daniels. - 3PW March Madness (March 19, '05) = Brown retained the 3PW Heavyweight Title, winning over Amish Roadkill. - 3PW Spring Cleaning (April 9, '05) = Brown stayed the 3PW Heavyweight Champion, beating Amish Roadkill. - 3PW Mayhem (May 21, '05) = Brown lost the 3PW Heavyweight Title, losing a "Three Way Dance" to Amish Roadkill. Simon Diamond was the other participant. - 3PW Resurrection (June 18, '05) = Brown fell to Simon Diamond. - DPW Redemption (October 8, '05) = Brown lost a "Three Way" Match to the DPW Heavyweight Champion, Luis Ortiz. John Walters was the other participant. - DPW Scorned (April 8, '06) = Brown lost a "Three Way" Match to the DPW Heavyweight Champion, Luis Ortiz. Jose Perez was the other participant. - DPW This Thing of Ours (August 12, '06) = Brown won a "Three-Way #1 Contenders" Match over Tony DeVito and Dylan Kage. - DPW Broken Dreams (September 9, '06) = Brown fought to a Draw with Nocturne. Later on, Brown & Nocturne fell to Primal Instinct (Dylan Kage & Luis Ortiz). - DPW Perceptions (November 17, '06) = Brown won the DPW Heavyweight Title, winning a "Three Way" Match over Jose Perez and Antonio Thomas. - DPW Brutal Liasons (February 10, '07) = Brown retained the DPW Heavyweight Title, beating John Walters. - DPW Through The Fire (July 28, '07) = Brown stayed the DPW Heavyweight Champion, winning a "Three Way" Match over Eddie Edwards and Brian Fury. - DPW Dark Tiding (December 15, '07) = Brown lost a "Three Way #1 Contenders" Match to Ron Zombie. Justin Credible was the other participant.